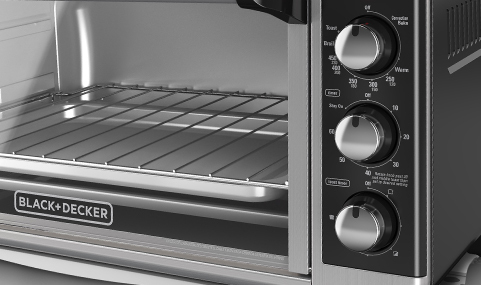 Meet our Largest-Capacity Toaster Oven! 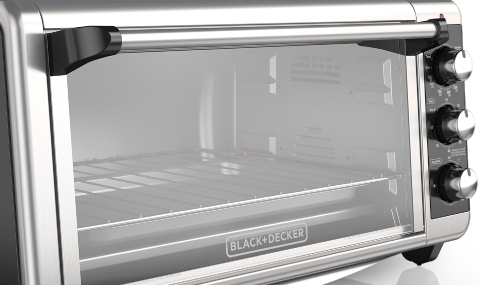 The BLACK+DECKER TO3250XSB Extra-Wide Toaster Oven will simplify large baking tasks. Its extended interior fits an entire 13”x9” pan, so you can bake lasagna, brownies, and even 12” frozen pizzas in no time. You won’t have to wait around for your large oven to preheat anymore, just set the correct temperature and time and you’ll be baking in minutes with four different functions: bake, broil, toast, and keep warm. Advanced convection technology circulates air within the oven for fast and even results while baking. Plus, the external crumb tray is easy to slide in and out, making cleanup a breeze. The 30-minute precision timer includes a stay-on function for longer cooking tasks, and the dedicated toast timer finds the right shade. The crumb tray slides out from underneath the toaster oven for easy cleaning. 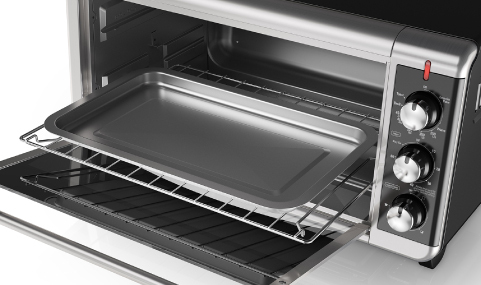 Enjoy an expanded interior capacity that can easily fit a 13” x 9” pan or six slices of bread. Choose from four different cooking functions: Bake, broil, toast, and keep warm. Extra-Wide 8-Slice Toaster Oven is rated 3.0 out of 5 by 43. Rated 1 out of 5 by Julie K from Bottom elements not working I bought this oven recently and tried using it to bake and only the broil element is working. Rated 1 out of 5 by Majormom from Very poor manual instructions Like everyone else I was trying to put the crumb tray in the bottom from inside the oven. None of my food was cooking from bottom so I thought it was defective. The manual should be more detailed so more customers know how to properly set up their oven and not want to return it! Now that I’ve been on this website I have figured out that the crumb tray needs to go in from OUTSIDE the oven. Now it works perfectly. It’s a shame so much food was wasted before I figured this out. That is why I o my rated 1 star. VERY POOR MANUAL INSTRUCTIONS!!!!! Rated 1 out of 5 by Shreveport71119 from POOR DOCUMENTATION... SENDING IT BACK...A huge flat pan probably crumb pan comes with it..But where do you put it. INSTRUCTIONS SAY NOTHING ABOUT CONVECTION...French Fries that take 20 minutes in over took 40. Probably due to placement of crumb tray..Say 3 levels I see 2. I bought this because of the black and decker name...Never again..Instructions are terrible. Rated 4 out of 5 by C Michaels from Works great but only after trial & error I bought this several months ago and have used it in many capacities- baking, reheating and toasting. 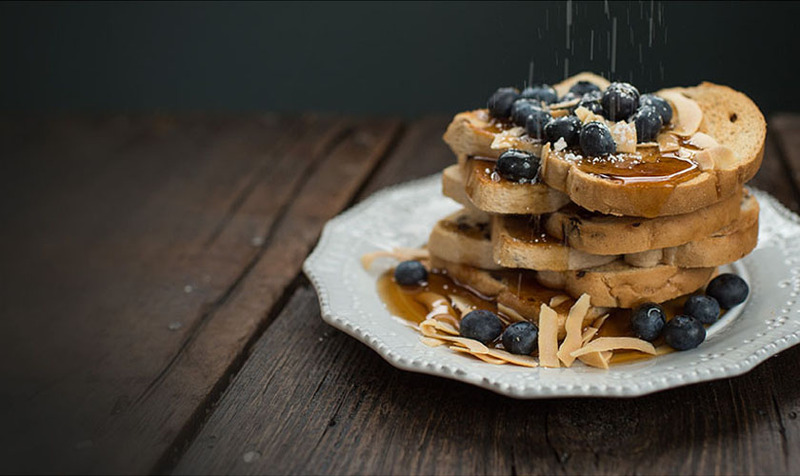 However, if the crumb tray is left in the oven while toasting, the underside of the bread remains soft and does not toast. It toasts fine if I remove that tray, which seems to defeat the purpose of the tray, because then crumbs can fall to the bottom of the oven. Now I'm wondering if I should remove it when baking, as it seems to take several minutes longer for some things to bake even if I use a higher temperature. It seems like the tray blocks the heat underneath the food. I would like to know if it is meant to be left out sometimes to allow for the convection air flow to be more effective. Other than this issue, I do like it. Rated 2 out of 5 by Older Grandma from Need More Info Recently bought this. My broiled pork chops came out perfect. But then I baked a peach cake. It didn't want to cook. I needed know to adjust the temperature so I set it at 350 as normal. when the normal cooking time was over, it had hardly begun to bake. I put it back in for 10 minutes and the top browned but the inside was still uncooked. I then kept checking it at 10 minute intervals after about 3 more times, I took it out as the top was getting too brown. The inside still was not quite right but it tasted great. Can I please have some better instructions on how to bake in this oven. Also what do the small numbers under the temperature numbers mean? Rated 1 out of 5 by Nikki Say What from Doesn't work at all! Just bought this today...got home and wanted to try it out. It doesn't work at all. Such garbage. What a waste of money. Rated 1 out of 5 by slim from Took it back Might have liked it, but the plug-in cord is extremely short. Wanted to place oven on a heavy-duty roll cart. Cord would not reach a standard outlet. Took it back. Very disappointed! I don't understand what the label is for on the top knob. At the 2 o'clock position it says convection bake but there is no temperature gradation. What does this mean and how do I turn on convection. Thank you for your question. This oven will turn on the convection fan automatically when it has been set to bake, regardless of the temperature selected. The convection fan cannot be turned on or off, however. The &quot;manual&quot; says to turn the dial first to 20 minutes then to any time desired. But once it moves forward, the dial can't be turned backwards! Does this toaster oven have a non stick interior? I want to build a shelf to mount a B&amp;W Convection Oven, Model TO3250XSB, in my kitchen. How much space do I need to plan to leave behind, above and on the sides of the unit for ventilation so I will be safe and not damage walls or cabinets? Looking up recipes, where would I go? What are the outside dimensions including the handle?